My Write Out posts are intended to inform writers (and teachers who have papers to grade, it seems) of the nature of different potential writing spots. The elephant in the room is the number of really obvious places that most writers already know. I intended to hold off on some of those venues for a while, but fate intervened this week, and I did my Writing Out at the Book Fare Cafe, which is about as well-known locally as a coffee spot can be. Even so, I think some of the details may help newcomers to Bellingham decide on a place to sit and write. I came to the Book Fare to meet a writer friend who was putting the final touches on a volume of poetry she’s publishing. (You can look for Madrona Grove: Poems Written Under the Canopy by Shannon P. Laws at Village Books, beginning this week.) 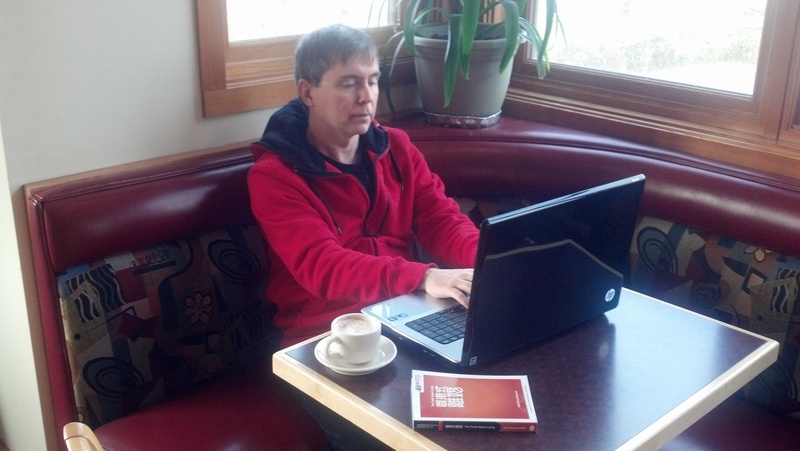 After we had a look at the excellent volume produced by the Village Books Espresso Machine, we settled down to write. That, folks, is how I wound up at one of the best-known venues in town. The Book Fare draws writers in part because of its location. Writers are readers, and the Book Fare sits in the upper northwest corner of Village Books in Fairhaven. Thus, readers are tempted to sit and Write Out, and writers are tempted to buy more books. If you are addicted to both books and caffeine, this place is real trouble. The café is another venue with ample windows and a good lighting angle. Too good, at times; Shannon asked at one point if I wanted her to close a blind. I was so zoned that I hadn’t noticed that I could barely read the screen of my laptop, but you’ll want to take the sun into account when you choose your seat. Another consideration is that most tables have no access to electricity. One tall table at the front of the café has an outlet, and there’s one in the corner. Some of the comfier seats won’t allow you to plug in, so come fully charged. Using the sofa as a writing headquarters is worth any logistical issues. 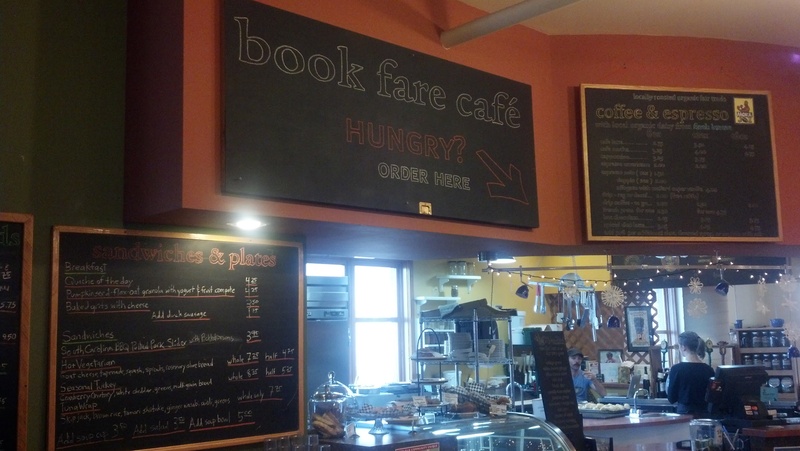 The Book Fare has a well-developed food menu, with a rotating variety of soups, as well as baked goods, including GF items. If you’re acquainted with the place at all, you can tell it’s a writer-friendly venue. Grab a drink, write till you need to recharge, and eat. Then write some more. It worked for me. And for Shannon P. Laws. It was great fun to have her around to keep me on task. Another writer friend has already asked if I would mind company on these excursions: the answer is that I welcome it. So, if you ever need a partner in crime for Writing Out, get hold of me. And what have I accomplished this week, between my Writing In and my Writing Out? Much good work! I was able to do some editing on my nonfiction manuscript. I’ll send it shortly to the Chanticleer Book Review contest. Apart from that, this blog generated the inspiration (via Cami Ostman) for Red Wheelbarrow Writers to take a field trip on February 9, 2013 to the Beach Store Cafe on Lummi Island. We’ll ferry out, write, eat, drink coffee and wine, read our day’s work, and ferry back. If you’re interested in joining us, let me know—you don’t have to have prior contact with RWB to come along. Space is limited, of course. If those links make it seem as if I’ve started accepting payola, it’s not so. It’s simply that the blog and two gracious writers’ groups (the other being Whatcom Writers and Publishers) have given me enormous networking opportunities, and I’m passing along to you what I have found helpful. You should also check out the blogs I follow, because some wonderful writers are at the helms. Impressive and inspiring information…a good resource for local writers. Love this Sean! I’m really enjoying these posts, even if my travel has left me a lame communicator. I need to start Writing Out more. I get too distracted at home: oh, think I’ll put that stuff away; hey, I need to vacuum/eat/make a call/eat/, etc… I think I’d focus better out and about. Love the posts! Thanks for sharing. I’m going to have to visit some of these places. They all look so good. I don’t think Indy has places like this. I’ll have to do some investigating. Thanks Sean!